Geothermal Loop Contractor - Portland, Or. | The Excavators LLC. At The Excavators, LLC, we are proud to offer energy efficient options for your ground looping needs. As a part of the geothermal movement that is sweeping the nation, we offer geothermal ground loops as a way of making your heating more affordable. As a family owned and operated company, we believe in putting our customer’s needs before our own and will do everything to make sure that you are completely satisfied with your ground loops. With the highest quality equipment and the most up to date technologies available, we truly provide our customers with the best geothermal ground loops in the industry. 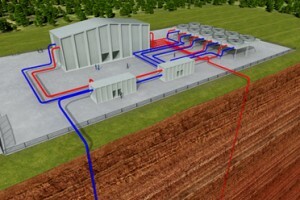 Why choose us for your Geothermal Ground Loop work in Portland, Or.? The loops go deeper for better conduction. We offer the loops in addition to entire packages for trenching. We offer semi vertical ground loops with our directional drilling services. Our looping services create much less damage to your property and makes better use of your land. We serve the Portland Metro area and will travel to ensure the satisfaction of all of our customers. You will save on utility bills with geothermal energy. With three generations serving the residents of Portland and surrounding areas, we believe that our most recent upgrade in technology to geothermal ground loops will benefit our customers the very most. If you are ready to save on your utility bills, experience less damage to your yard during installation, and enjoy customer service that simply cannot be beat, you have come to the right place. Contact The Excavators, LLC today to have all your questions answered and all your needs met. The Excavators, LLC also specialize in sewer repair in Portland. Call Eric LaRue at 503.869.0910 for more information on geothermal ground loops. Service Name: Geothermal Ground Loops Portland | Service Area: Portland, OR | Last Modified: June 13, 2016 By: Geothermal Loop Contractor - Portland, Or. | The Excavators LLC.